Carnlough (/kɑːrnˈlɒx/ karn-LOKH; from Irish Carnlach, meaning 'place of cairns') is a village in County Antrim, Northern Ireland. It has a picturesque harbour on the shores of Carnlough Bay. Carnlough is on the Coast Road beside the North Channel and at the foot of Glencloy, the second of the nine Glens of Antrim. 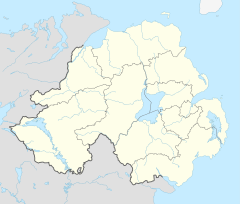 It is situated in Mid and East Antrim district, as well the historic barony of Glenarm Lower, and the civil parishes of Ardclinis and Tickmacrevan. It had a population of 2,084 people in 2016. The harbour was built by the owners of the quarries west of the village. These were connected to the harbour by means of a mineral tramway network, which include a bridge over each of two parallel streets in the village (both of which remain today). The harbour has recently been renovated and is used by pleasure boats and small fishing boats. The area offers many opportunities for both sea angling and fresh water angling. The Londonderry Arms Hotel was built in 1848 as a coaching inn by Frances Anne Vane Tempest, Marchioness of Londonderry, great grandmother of Winston Churchill. In the school, St McNissis, now known as St Killians, was originally built as a summer residence by Frances Anne. There are three main educational institutions in the area. These are: St.John's Primary School[permanent dead link], St Killian's College, and Carnlough Controlled Integrated Primary School. The latter was known as Carnlough Primary School up until 2004 - but as the non Roman Catholic population began to dwindle, numbers fell at the school. A primary school in nearby Glenarm has since closed and the two schools have now merged into one integrated school. There were two IFA junior football teams based in the village. They were Carnlough United and Glencloy Swifts. Carnlough United were founded in 1964 and started off in the now defunct Larne and District Junior League. In 1994 they joined the Ballymena Saturday Morning League. At the beginning of season 2007-2008, Carnlough United entered the Junior Division 2 section of the Ballymena and Provincial League. Glencloy Swifts were established in 1994 and following one season in the Larne and District League, they entered Division 3 of the Ballymena Saturday Morning League. They spent several seasons struggling in the lower reaches of Division 3, before finally becoming a force at the turn of the millennium. Glencloy Swifts secured their first trophy in 2003 when they won the Crawford Cup. Glencloy Ladies, now defunct, played in the NIWFA League. Carnlough man Brendan Rodgers is the current Leicester manager, a former Northern Ireland schoolboy international and manager of Chelsea reserves, and the former manager of Liverpool F.C. He previously managed Celtic, Swansea, Reading and Watford. In his first season as Swansea manager he led them to promotion to the top flight of English football for the first time since 1983. In 2016, he won his first major trophy as a manager, when he guided Celtic to the Scottish League Cup, completing an undefeated domestic treble later that season. Four oared gig racing has a measure of popularity in Carnlough. Up until recently craft for this sport were the product of local boat builders and during the summer crews may be seen training out on the bay. A highlight of the gig racing calendar is the Annual Regatta which takes place in May and attracts crews from all over the country to take part in the Round the Rock Challenge. The local rowing club is Carnlough Rowing Club, who have over 100 members and are part of the Irish Coastal Rowing Federation. The club's ladies section competed at the 2007 All Ireland Championships which were held at Union Hall, County Cork. In 2008 the Veteran Ladies won a bronze at the All Irelands which was held in Cairndhu. 2009's All Ireland a combined crew of Glenarm and Carnlough won a silver in the Veteran Men. The club was featured on the BBC documentary programme Coast. Carnlough are represented in the Antrim Camogie Association by the St John's club, where they are represented at U12 and U16 level.From March 2008 St. John's started a Senior Camogie team who contest in the 3rd Div of the all county league. Numbers have increased from last year and the club is going from strength to strength. Other popular sports in the village include, darts, pool, gunsports, golf, hurling, Gaelic football, angling, and walking. Carnlough lies within the Carnlough electoral ward of Mid and East Antrim Borough Council's Coast Road District electoral division. Of the five electoral wards which make up the Coast Road district electoral area Carnlough is the only ward with a Nationalist majority and the only majority Nationalist ward in the whole of the former Larne Borough Council area. Sinn Féin have seen their vote increase in the area and opened a constituency office in Carnlough in 2012. Carnlough Orange Hall was destroyed in a sectarian attack in 2000. Recently there has been strong opposition to controversial Orange Order parades in the village. The twelfth of July celebrations are held in the village every 7 years. The last being in 2007 where a local residents group protested against the parade as well as a Royal Black Preceptory parade. On 4 June 1980 Irish Independence Party member and Larne Borough Council councillor John Turnley was murdered by the Ulster Defence Association as he drove to attend a political meeting on the Marine Road. On 19 April 1987 Loyalist bandsman Andrew Mason was beaten to death by two local men who were subsequently jailed for the killing. View of the Antrim Glens from Carnlough. Hotel in Carnlough with Art Nouveau decoration. ^ 2006 annual report in Ulster-Scots Archived 2013-02-27 at the Wayback Machine North/South Ministerial Council. Retrieved 16 June 2012. ^ "Area profile - NINIS: Northern Ireland Neighbourhood Information Service". NINIS. Retrieved 24 June 2018. ^ "Carnlough". IreAtlas Townland Database. Retrieved 12 April 2015. ^ "Portadown District LOL No.1". ^ "CAIN: Peter Heathwood Collection of Television Programmes - Search Page". ^ "CAIN: Victims: Memorials: Andrew Mason Mural (Lisburn)". Wikimedia Commons has media related to Carnlough.